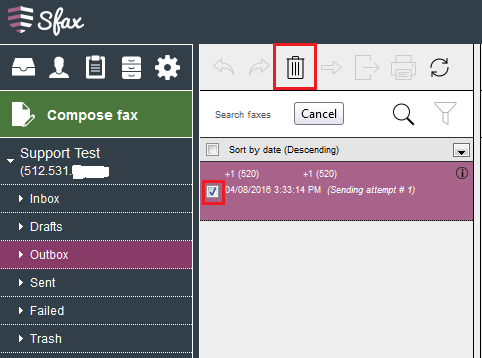 Within Sfax you can now cancel a fax by choosing the "delete" icon for a selected fax in your Outbox. Normally we will attempt to send a fax 6 times, however cancelling a fax will prevent future retries, but will not prevent the attempt in process. Depending upon the state of the fax there is a chance we will not succeed in cancelling. You will need to be logged in as the admin to cancel a fax or have the admin give you permission to cancel fax Setting user permission. 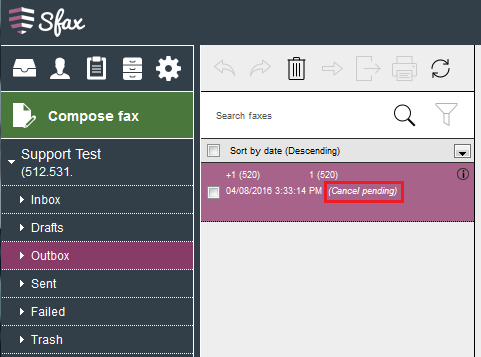 To begin the cancellation process, select the fax you wish to cancel and then click on the “Cancel” icon. Selecting “Confirm” can produce 4 results. 1) Cancellation Pending: We have flagged your fax for cancellation and will attempt to cancel. 2) Previously Cancelled: Someone already requested this fax be cancelled. 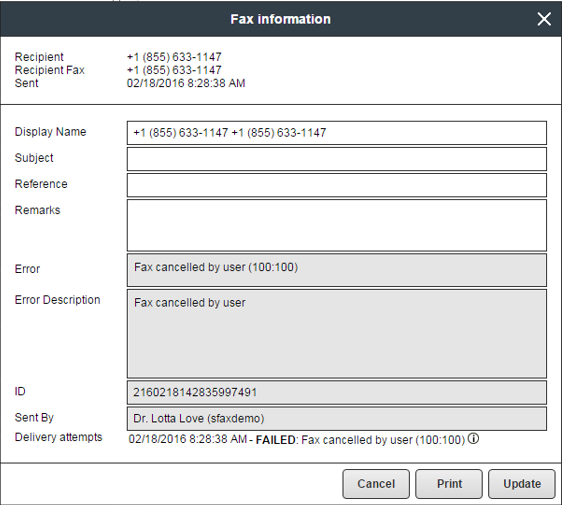 3) Completed Fax: This fax has already completed (sent or failed) and cannot be cancelled. Check your Sent or Failed folder for more details. 4) Cancelled Fax: Our records indicate that the fax was successfully cancelled but there is a chance the recipient received some pages. We recommend following up with the recipient to confirm. Once you’ve requested a cancellation, this status will update on the fax in your outbox. 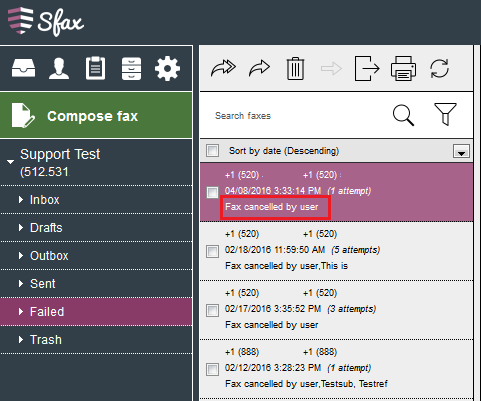 After a fax has been cancelled it will be located in your “Failed” box, and will include a "Fax cancelled by user" status so that a cancelled fax can be located by a quick glance. 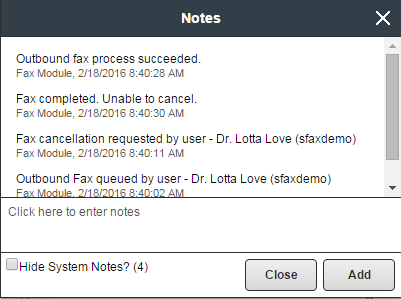 Once the fax has completed (cancelled, sent, or failed), you can access “Notes” for more details in regards to the fax cancellation process. If a fax completed before we were able to successfully cancel it we will include the cancellation request, the status of the fax, and whether the fax sent or failed for another reason (voice line, busy signal, etc.). If our records indicate that the fax was successfully cancelled, we will include the fax cancellation request and the confirmation for the cancelled fax. We always recommend contacting the recipient to confirm they did not receive the fax. 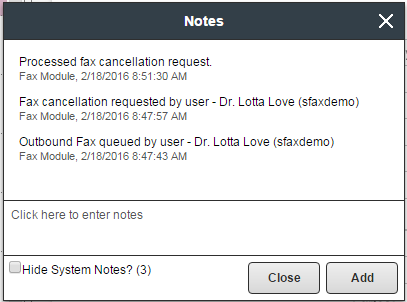 Once the fax has completed (cancelled, sent, or failed), choose the “Information” icon for more details.